Do you like the idea of being able to unwind in your outdoor space after a hard day’s work? Spending some outdoor time during the night will be much more enjoyable if there is a fire pit to keep you warm. Here’s a fire pit project that allows you to personalise the edge. If you haven’t tried making a mosaic before, this could be it. 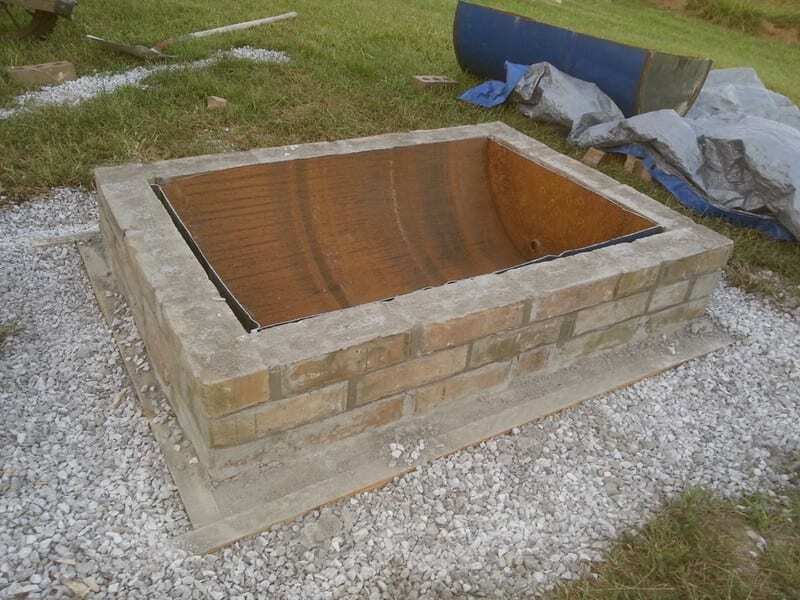 This weekend project is suitable for those who have smaller outdoor space and don’t need to move fire pits from time to time. Could this be the fire pit for your yard? Creating your blueprints. Now that you know what materials you will be using its time to begin putting the design on paper. Since you know the design will be based around a 55 gallon barrel we can begin by drawing the dimensions to scale on graph paper or in a cad program. The barrel i used has the dimensions 23.5″ x 34.5″ which means that the inside edge of the foundation needs to be larger than that. Lets start by drawing the 2×4 forms we will be setting in place to pour the foundation. Foundation blueprints. To create the foundation blueprints we will start by drawing the actual dimensions of the foundation itself to scale using graph paper. Next we will encase the foundation in forms by drawing 2×4’s to scale around the inside and outside of the foundation. This way we can double check our math on what length to cut each 2×4. Capstone blueprints. Creating the capstone blueprints are almost exactly like the foundation blueprints with the exception that you will cut the inside walls with 45 degree miters. This is done to keep the water saturated concrete from swelling the inner layer of wood in the malemine which is basically just compacted sawdust. Now that you have your blueprints, lets get some real work done. Start by digging out an area about twice the size as your pit. Dig down 6 to 8 inches and make sure to inform your neighbors its not a grave. Try to dig it out somewhat level. Now get out your foundation blueprints and cut-list and begin cutting your 2×4’s to proper length. Now you can construct two boxes which will create the foundation forms for the concrete. Pay special attention to squareness and levelness while constructing your forms it will make it easier on you in the long run. Once the forms are complete lay them in your dug hole and center them up. True them to each other by measuring the distance in between the inside and outside form in several spots while adjusting them. Once your forms are in place level them ( this may be one of the most important steps ) make sure that they are not only level but level with one another by placing the level across both forms in several spots. This step may take some time but time well spent here will make it easier for the duration of the project. Now its time for our first concrete pour. Do a quick search online of what your concrete should look like when its ready to pour. Shovel the concrete into your form it should take less than two bags. Fill the forms full and overflow them, take a scrap piece of 2×4 thats long enough to span the forms and screed the concrete to the same height as your level forms, creating a level foundation for your project. Now grab a cold beverage of your choice and kick back in a chair and envision what your manfire-pit will look like. Allow a couple days dry time. Brick Laying. It doesn’t have to be perfect and mine sure isn’t but make an extra effort on the last layer to make it level so your capstone will seat right and not wobble. Also on the last layer take and fill the holes in the bricks as added level support to your capstone. Let them sit for around 4 hours before continuing. For mortar joints: Take a wire brush and brush every joint so that they all look consistent. Worked great just make sure you wait 3 or 4 hours before you do this. While you are waiting it’s a good time to split your barrel in two with a cutoff wheel, or sawzall (be careful and check what contents were in the barrel previously and watch for flammable liquids, if needed, purge barrel with argon or other non flammable gas for added protection). Now take and test fit your barrel half into your man-pit. Test fit both pieces as one will probably fit better since its tough to split a barrel in half perfectly. Save the other half as we will use it to make an accessory to the pit. Once again kick back have a cold beverage and in a couple days once your mortar has set test out your pit before moving on to the most labor intensive step thus far. Pull out the capstone blueprints,the malamine sheet and your large box of 3″ screws (malamine is used because the water in concrete will not make the malamine swell as long as it doesnt come in contact with the inner wood on the sheets). Grab the cut-list and begin ripping 2.5″ strips of malamine off the 4′ side followed by cutting the strips to the dimensions you determined on the miter saw. Make sure the inside wall has 45 degree miters on them, the goal is to make sure as little of the inner wood is exposed as possible, then use caulk to seal those places. First take a sharpie and layout the dimensions of your capstone, this way you know that the box you build should keep the lines you have drawn inside it. If you look closely in picture 1 you can see the layout done in sharpie, also you can see the 45 degree miters on the inside form. Take the pieces of 2.5″ malamine and dry stack it to ensure it will be correct. Now were ready to secure our forms to the base. Take a 3″ drill bit smaller than your wood screws and begin drilling pilot holes through the strips and into the base, i started with one corner than the other corner making sure the inside edges lined up with my sharpie lines, secure the ends with screws. Then drill every 3″ inches and secure with a screw. Take the extra time to make sure your forms are straight and make good corner joints. Once you have your form made and screwed down, take some silicone caulk and caulk all the joints to keep the water in the concrete from getting into the wood. This also will create rounded edges which looks better and from a parents point of view may be the difference between a bruise and stitches from a sharp corner. There are endless possibilities for aesthetics for your cap stone, i chose broken glass bottles, shot gun shells and a camaro emblem. Anything you want to strategically place, use spray glue and glue it to the form. And dont forget like i did to glue some glass to the side walls so they dont look plain. Now we need to insert remesh for added support and longevity of life. Without some kind of reinforcement it will probably fall apart at some point. Pick up some remesh from your local supplier and cut it to fit inside your form making sure that it will not come within 1″ of any wall. Then get some small pieces of 2×4 and make spacers to hold the remesh above the surface of your form while you secure it with wire. I drilled and inserted screws on the outside of the mold every 5 inches inside and out then secured the remesh to them with copper speaker wire. Once the remesh is tied off all the way around then remove your 2×4 blocks. Whalah were ready for some more concrete. Now its time to fill your form with concrete. Grab a couple bags of quikrete 5000 and mix to the same consistency as the foundation maybe a hair more wet. Using your hands to start off gently lay concrete into the form all the way around the form until your about an inch deep so not to disturb the manly decor underneath. Once you have it built up all the way around to about 1″ you can get more aggressive with it. Fill it till its slightly overflowing. Now grab a rubber mallet and begin wailing on the form in a downward motion striking the outside of the form for approx. 10-15 minutes, this is to vibrate out the air bubbles in the concrete which weaken the concrete and give a bad appearance. Let the mold sit for 20 minutes then wail on it some more. After two or three sessions screed off the overflowing form to a nice level surface. The curing of concrete happens over a prolonged period of time, up to 30 days. We want to catch it before it has hardened to the point of requiring diamond grinding pads which are costly, instead lets catch it while its soft enough to use traditional grinding stones and sand paper. Around day 2 or 3 is when you want to move on. Once the concrete is starting to harden to the point that you have trouble scratching it with your fingernails then its time to take apart the forms and flip the capstone over so you can grind and sand it. The outside of the form is easy remove the screws and put them back in there box for another project and remove the outside form walls. The inside walls may be more difficult. I chiseled a corner of one wall off then removed the rest one at a time. Be careful during this process and pay attention to the concrete, if you dont think its hard enough to flip then wait another day but if it is then grab a buddy and flip it over and begin the grinding process. I did my grinding at a different point than most that make concrete countertops. Most suggest waiting 5 or 6 days then using diamond grinding pads to sand the concrete to a mirror finish that resembles granite. I on the other hand didnt want to go that far with it, i wanted it to look more natural. So after two days i decided instead of waiting til it was super hard and investing in diamond pads, i would wait two days and hit it with regular sand paper and grinding wheels. I gotta say i think it turned out rather well. The concrete was dry enough to hold shape but soft enough to sand. Use a 2×4 as a sanding block if you dont have one. First use a regular grinding wheel to expose the aggregate and broken glass, it wont take much so dont use any pressure. Once you have the desired amount of aggregate and glass showing move on to sanding with 60 grit paper. Use the 60 grit to get a flat surface and remove your grinder marks. A 2×4 or sanding block makes it pretty easy. Make sure to sand the sides of the capstone as well as the top and to make it extra smooth keep the capstone slightly wet. Once your done with 60 grit repeat this step with 120, 180, 220, 320, 400 and 600 at which time you will be done. Setting the capstone. A week after the pour its time to set the capstone, theres two ways you can do it, set it in mortar, or drystack it. I decided to drystack just in case i ever needed to access the barrel. Grab a buddy and tilt the stone up and set it in place, making sure to center it. Before sealing the capstone give it a good bath and let it dry very very well before sealing. After doing some tests with a thermometer i believe any sealer would work on the surface of the capstone due to the fact that it doesnt get hot. However the inside edge does, i recommend using some 1200 degree black grill paint on the inside edge, then seal the top, i used 1200 degree clear coat but may go back later with epoxy. Let it sit overnight. Now you need to cure the high temp paint or clear on the capstone, to do this start a small fire inside the pit and let the capstone slowly warm up, the next day start a slightly bigger fire and the third days start a full size fire. This will cure the ceramic in the paint. Drill 1/2″ holes every 6 inches in the bottom of the barrel in the pit so water can drain out. Take a green, straight stick thats around 4 ft in length and has a smaller end diameter of approx. 1/4″. Shave the end to a point, now move up 6 inches and score a line around the diameter of the stick with ur knife cutting through the outside layer of bark, move up 1″ and do the same. Score a line from the first score line to the second and peel the bark off to make a clean cut revealing the white under the bark, repeat every 6 inches. Take the other half of the barrel from this build and cut the circular ends off leaving you with a rounded piece of sheet metal, place in the pit as a removable bottom which makes ash removal a breeze and also keeps the bottom of your barrel from ever burning out. Almost a must for this fire pit, take some 1″ angle and expanded metal and weld together a grate that will set on the manpit then take two 1/4″ brake lines or stainless lines thats about a ft in length and bend them into a handle so you dont need gloves to pick it up after cooking with it. Isn’t this a great fire pit design? If you are in for a grill, you can do so without any difficulties because of its wide and level top. You can even use the capstone to place your drinks, especially during the cooler nights! 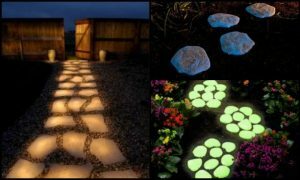 It’s truly a quality outdoor feature and yet very easy to make! Thanks to RNation0001 for this great tutorial! hi! Looking for fire pit ideas for our family farm, something we can all build together in a three day weekend. But my question is, can we skip the barrel? Can we just burn wood in the brick and cement surround?